Use as a Question or Brain Teaser of the day on the daily schedule of activities handout or on a display board. Finish the Nursery Rhyme #2 includes: Instruction guide for using this resource Set of 24 cards Each Card Measures 3.75in/height x 5in/width Below are a few ways Finish the Nursery Rhyme #2 can be used: Individually – One to One – Visitor Packet Memory Recollection – Word Association Ice Breaker Whole Groups Small Groups Intergenerational Programming Open House/Family Night Parties/Gatherings Banquets/Appreciation Dinners Set up is simple. Just print, cut, laminate, and play. Participants must choose one card and “Finish the Nursery Rhyme”. There are many ways to play, so as to include all capabilities. 1 - Just say only the words on each card; 2 - Say the words and give a clue of how many words are needed to finish the nursery rhyme by counting the blank spaces; 3 - Use in a game of Wheel of Fortune/Hangman – participants buy/choose letters until the Nursery Rhyme is complete; Challenge: Mix the cards up so that each card is a part of a different nursery rhyme. 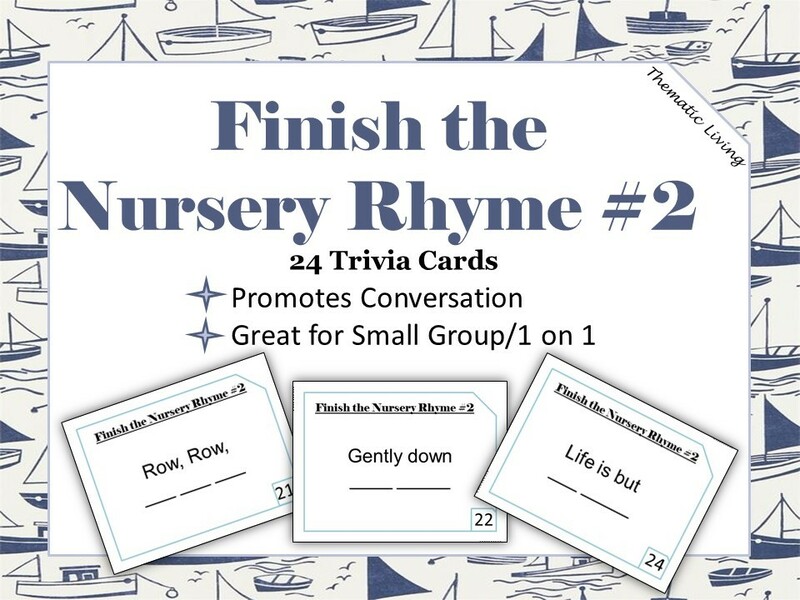 Note: 1 page/4 cards = 1 Nursery Rhyme In small groups, participants will need to work with a team (family members, other residents, etc.) to complete the nursery rhyme. For best results, laminate the cards before use. Hole punch one corner and bind the cards together with a binder ring or ribbon. Buy it once and use it for a lifetime.